This is a "Free Product" Review - Free product in exchange for honest review. “Know what this book is about?” I asked my husband. “Umm, connecting church and home?” he guessed. Yes, he’s humorous. If you were just passing by and glanced at this book on a shelf, you might not get much more than that, either. Yes, this book is about bringing the church and the home together and uniting them with a common goal–but there is so much more packed inside this tiny book than first impressions may give. For me, the timing of receiving this book was impeccable. But then, God always has great timing. 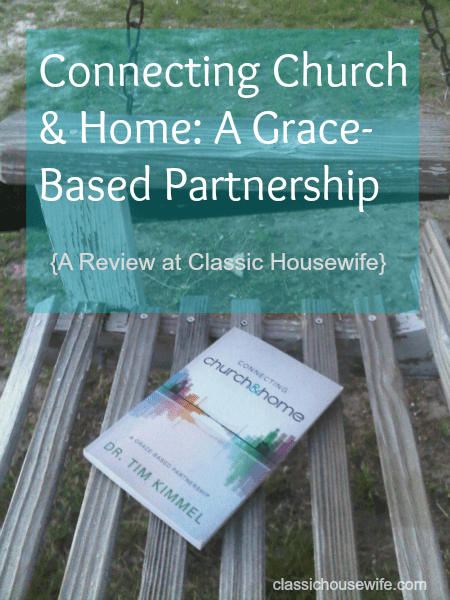 “Connecting Church and Home” is a short, 137 paged, paper back book that is packed full with advice, information, strategy and practical application for Dr. Kimmel’s Grace-Based approach to ministry. In fact, there were so many things that stood out to me and spoke to me that I found myself underlining or circling something on nearly every page – sometimes 3 or 4 things on a single page! Tim Kimmel is the founder of Family Matters and the author of the well known book, “Grace-Based Parenting.” If you’re familiar with his previous work, you will recognize much of his approach in this book, but this time Dr. Kimmel takes it beyond parenting and into the church. If you’re not familiar with Tim’s other books, you won’t be lost or at a disadvantage as Dr. Kimmel takes the time to explain his Grace-Based model for new readers so that everything ties together and makes sense. New readers and familiar readers will both benefit and be blessed by this book. 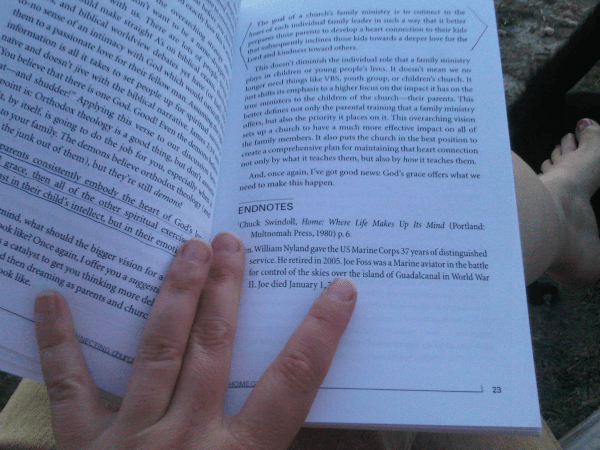 Is “Connecting Church and Home” Written For Pastors, Church Leaders or Parents? The answer is “all of the above” – this book is written for pastors, other church leaders, AND parents. Many parents today rely on churches for the bulk of the spiritual teaching in their childrens’ lives. Many churches today are struggling to effectively train and disciple families and children because of the limited time they get with families throughout the week. The answer is that families and churches should be working together. One of the things Dr. Kimmel encourages the church to do in this book is to have an over-arching family ministry vision and goal for the church so that everyone from pastor, to family pastor to youth pastor to teacher to Mom and Dad can be working together for the same purpose. For church leaders he provides a sample ministry framework that can be tailored for an individual church regardless of size, etc. Tim also writes for the parents to empower them and encourage them to exercise their spiritual influence in their family. Again, there were so many things that I underlined, circled, starred and marked, but there were three “big things”, key points, that I feel every reader should take away from this book. 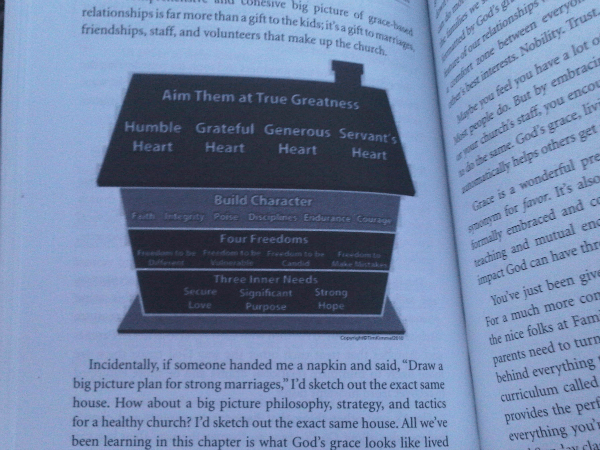 Tim’s Grace-Based Model – Tim explains his vision for Grace-Based Parenting/Ministry using an example of a house. The foundation of the house is the child’s three innate inner needs. The next layer above is the child’s four freedoms. The final layer of the house section is building a child’s character and the roof on top is aiming your child for greatness (as God defines “greatness.”) You can read more about Tim’s model on their website, using the menu on the right hand side of the page to read about the “Overview” and each of the four layers of the Grace-Based house model. The “Family Land” road map – a road map and overview of all the “stops” on this adventure ride called parenting. Parenting doesn’t happen all at once, neither does discipling, it’s a journey, an adventure, with many milestones along the way. 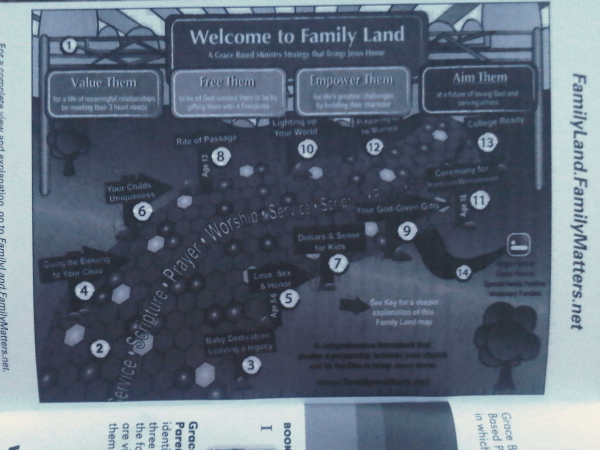 There’s an interactive “Family Land” map on the Family Matters site which further explains the purpose of this “map” and how parents can use it. Parents and churches need to work together. This isn’t another “it takes a village” idea. This is the way it works. Parents can most effectively parent their children with the support of good training and discliping at church. Churches can most effectively train and disciple their young members with the support of good parenting at home. They work together. As I mentioned, God’s timing with sending me this book was impeccable. Our church is in a place of expanding and growing our areas of ministry and serving. The week before I was contacted about reviewing this book, I expressed a God-given desire to minister inside of our church family, for the church family, for both individual family units and our church family as a whole. Isn’t God amazing? I truly enjoyed reading this book and learning more about how families and churches work together, learning more about grace and family ministry and everything in between. I found all of it extremely interesting. I have asked my husband to read it next and plan to pass it around the church to anyone else who might read it also – there really is something in here for everyone from parent to teacher to each different kind of church leader. I want to thank Jamie Reeves with The A Group for sending me a copy to review because I found it particularly intriguing and fascinating. For more information about the book, the Family Matters group, Tim Kimmel, or any of his other books, visit their website FamilyMatters.net. I’ve heard so much about his Grace-Based Parenting but haven’t read it yet. I look forward to reading it in the near future.